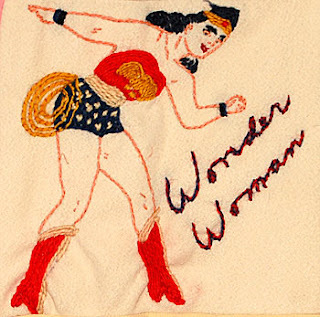 Cindy posed some questions to the seemingly “wonder women” quilt/craft bloggers who seem to do it all. so. darned. well…. And don’t we all compare ourselves to these bloggers at times? I tend to “measure” myself against other people too often, and every single time, I come up wanting. If I let these thoughts take over, it cripples me to the point of not accomplishing anything, and even feeling as though I want to stop blogging and quit reading blogs. Silly, huh? Journaling my creative endeavors and my life on this blog inspires me to do more, and seeing what other people are creating, well, that’s inspiring, too. It’s therapeutic for me as well…the blogging and the sewing. To answer your question, “How do I do it all?”, the answer is quite simple: I don’t…. my work style is to have projects in various stages: designing, piecing, quilting, hand binding…. I have a theory that there are “work ahead” bloggers and “work in the moment” bloggers. As for how it all gets done, it’s funny that you ask that – I was just talking with a friend about that yesterday. I think that I spent 90% of my non-mom time sewing because it’s what I enjoy doing. It’s my stress relief… it’s what makes me happy. As for doing it all, we can’t. …had to decide to be happy with what I got accomplished and not compare myself to what other people get done. And I have to remind myself of it every day because I tend to want to try to do it all! …they can’t do EVERYTHING, there has to be something that is not receiving her full attention. …it is important to remember that we are not seeing the entire life of a person – just the crafty side…. …I’d love to have a regular stream of blog posts about fabulous projects I am working on…. the reality is that I spend a lot of time doing other things that are higher priority to me. Give yourself a break today—you don’t have to compete with the blog next door. Or the woman across the street. Tonight, I’m going to try and get a little sewing done. I think you also need to remember what the point of crafting (& blogging) is – it's different for each person! So some people craft & blog to make money, other people craft & blog for stress relief/me time… and most people aren't very forthcoming about these decisions! I love this post Doris. Sometimes I wonder when I am reading these blogs that show them get done SO MUCH is “when do they clean their house or see their family?” No one can do everything! I couldn't agree more with the Christmas letter point. That is so very true. It's interesting to read these things, Doris. I've never thought much about “keeping up with the other guy.” For me it's more about “Wow, I want to make that too!” and feeling overwhelmed with all the projects I see and want to make before I die. Blogging is for my friends, it's true. But it's also a sort of diary of my life. I don't write JUST about quilting, because there are times I want to remember my family, our travels, or even just the weather! I'm always thinking about what I want included in my blog book that I print at the end of each year. I'm in a happy place with my blog probably because I have time to do it. Love your post, Doris. I know exactly what you mean. I have to remind myself about these things all the time. I agree with LindaSchiffer…blogging is the escape. It's where we can go and leave our troubles behind!